Empower decision makers across your business with rich views of the data they need. With the rich, accurate imagery from Google Maps as the visualization layer, you can display data in a way that is meaningful and understandable, and help drive smarter decisions. Most data has a component that can be tied to a place: an address, postal code, global positioning system (GPS) location, census block, city, region, country, etc. Geographic mapping lets you visualize, analyze, create and manage data with a geographic component. And you can build compelling maps that help you visualize patterns, trends and exceptions in your data. Quickly visualize data on a map—such as sales trends, employee distribution, and retail locations—by using Google Maps in your business intelligence solutions. Make GIS data more accessible to users across your organization and across geographies with a web services solution. Evaluate real estate decisions by exploring demographics trends, competitive information, zoning, and more. 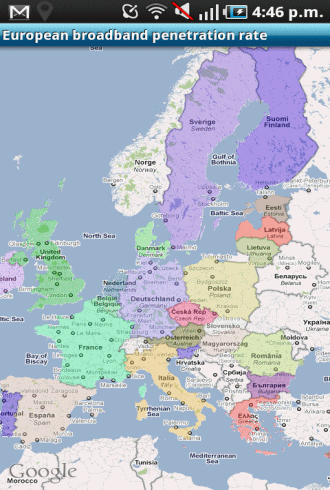 Predict risk and determine trends by plotting data on a map. Create disaster management solutions that allow decision makers to track health incidents, weather events, earthquakes, and more. To pan the map (but keep the same zoom level), change the value in the centerCoordinate property of the map view or call the setCenterCoordinate:animated: method. To change the zoom level (and optionally pan the map), change the value in the region property of the map view or call the setRegion:animated: method. 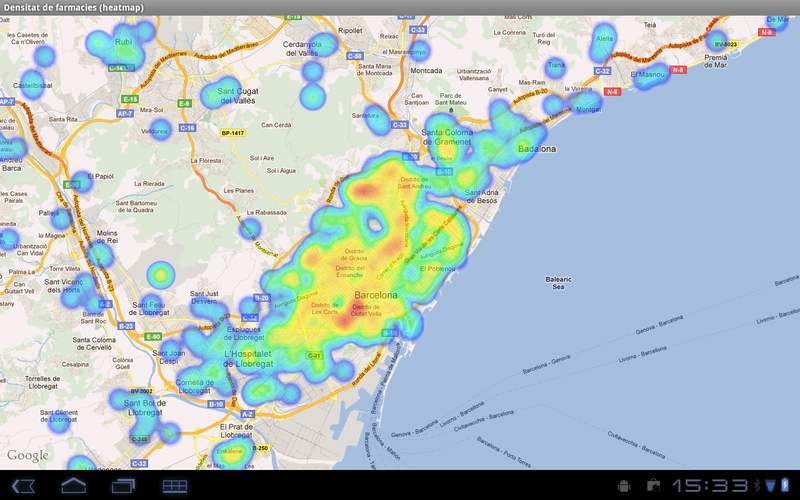 DroidStudio Maps can combine multiple sources of data. 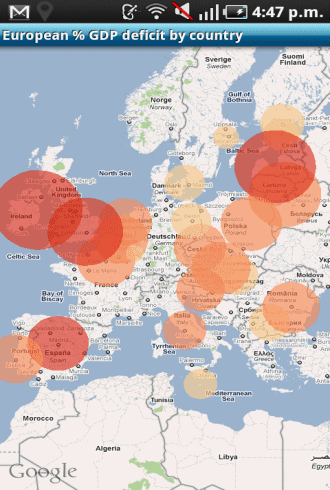 Combine your company geo localted data with sociogeographical data. A choropleth map is a thematic map in which areas are shaded or patterned inwhich shows to the measurement of the statistical variable being displayed on the map, such as population density or per-capita income. Choropleth mapping shows statistical data aggregated over predefined regions, such as counties or states, by coloring or shading these regions. Colored maps are not always the best way to display values, since large regions are emphasized much more than small ones. To address this issue, instead of drawing complex country shapes, circles can be easily drawn The area of each circle is proportional to the absolute value of the data. The heat map is one of the most useful and powerful data-analysis tools available in business intelligence. It is a visualization feature that presents multiple rows of data in a way that makes immediate sense by assigning different size and color to cells each representing a row. If the data points are valued, that is, each point is associated with a value, the graphical representation consists of regions known as areas of same value which can be filled with different colors or just be delineated by contour lines or both. Give a meaning to the colors and tones in the geometries shown in the map. Show detail associated with a geometry on the map by double tapping into a region in the map. Location-aware applications deliver online content to users based on their physical location. Various technologies employ GPS, cell phone infrastructure, or wireless access points to identify where electronic devices such as mobile phones or laptops are, and users can choose to share that information with location-aware applications.